If you are on Facebook, then Mark Zuckerberg owns a piece of you. He owns your pictures, your messages, your friends, and everything you’ve shared: His company knows about your preferences, your favorite brands, your needs, your desires… in essence, everything you’ve ever expressed: it’s his. Mark Zuckerberg owns your hopes and dreams. And he’s not about to let a few U.S. politicians get in the way of his grand plan. Through Facebook, Zuckerberg collects personal information – not just your phone number but the stuff that’s deepest within your heart and your mind, that you consider to be the essence of your existence: what makes you, ‘you’. How is that anything less than your soul? Zuckerberg uses his company to collect souls and then, in blithe disregard for basic rights of privacy and despite a decade of protests and warnings, he puts his collection of souls up for sale. Billions of souls, harvested by Facebook and sold off by Mark Zuckerberg on the open market to anyone willing to pay to own the collective conscious of the world. A Double Standard of Privacy… and For What? Perhaps Zucky is such a keen collector of souls because he lacks one himself. How else can we explain his seemingly complete lack of regard for any basic human sensibilities at all? Where is his compassion for the billions of users who’ve made him so rich? We know he understands the value of privacy because of the double-standard he’s created on Facebook, ensuring it for himself but only himself. Earlier this month, all of his own Facebook messages were deleted yet the feature is not available to his 2 billion users. And Facebook follows tough EU privacy standards (about to get tougher in May with GDPR going into effect) yet does not apply them to American users (because it’s not required). So the face of Facebook is merely that: just a face. Mark Zuckerberg does not care about your right to privacy. There is no soul behind the smug, wooden countenance that appeared before U.S. Congressional panels this past week. 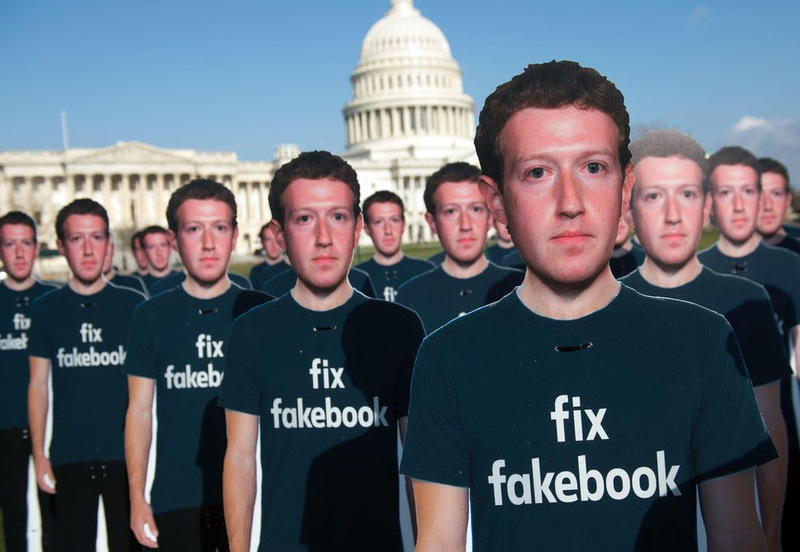 What sat before the cameras and answered questions could very well have been any one of the 100 cardboard clones that appeared on the Capitol lawn, expressionless and bot-like, unfeeling and unoriginal and completely unswaying in his assertion that he will prevail. But why have we entrusted our souls to this entity? Why have we allowed this to happen? That one’s easy: we’re addicted to Facebook and there’s no alternative. Zucky knows this- he planned it all along. Don’t let Zucky’s wooden apologies fool you. Cambridge Analytica was no accident. A quick review of Facebook’s privacy policies and statements over the years from Zuckerberg himself make it clear that user privacy has never been the priority at Facebook. He said so himself, stating that Facebook has always been about ‘community and connections’. Mark Zuckerberg cares about user privacy only when he’s made to. Facebook Self-Regulating on Privacy Matters? Never. Facebook will never self-regulate for privacy. That’s clear, in light of the derision Zuckerberg has shown for the basic human rights of his fellow human beings. Compassion, corporate social responsibility, thought leadership… all those things went out the window a long time ago for Mark Zuckerberg.